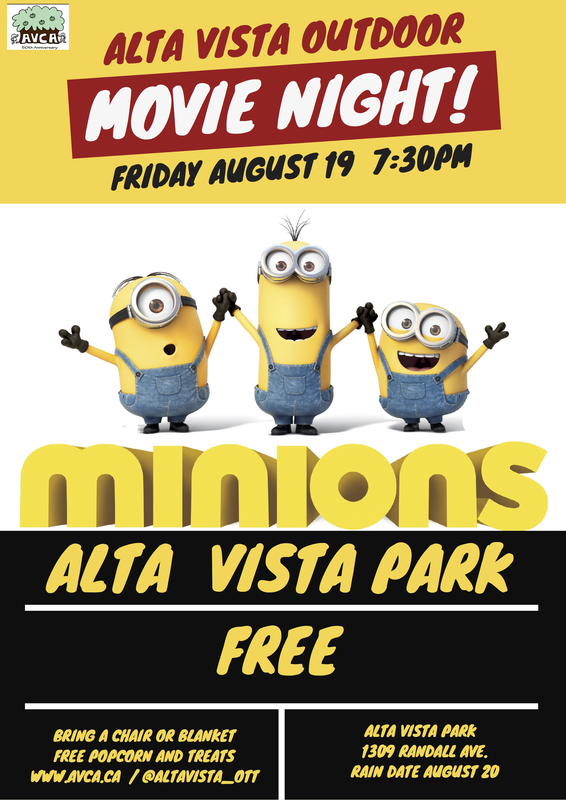 The Alta Vista Community Association (AVCA) invites you to our newest community event, The Alta Vista Outdoor Movie Night. This free family event is Friday August 19th at Alta Vista Park. Join us for special evening under the stars, bring a chair or blanket along with your family and neighbours to enjoy an outdoor movie and popcorn! Come early for a good spot. It all starts at 7:30pm and our feature movie will start at sundown. Earlier this summer we invited our community to vote for their favourite film on AVCA.CA and the winner of vote and our feature film will be: MINIONS! Thanks to everyone who voted, please share this message with your neighours and we hope to see you this Friday.